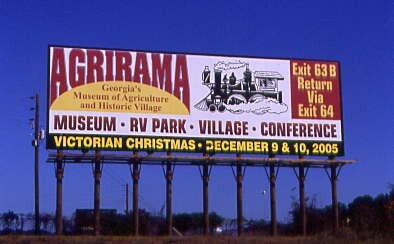 The Extra Day in Georgia featuring the Railroad at the Georgia Agrirama Living History Museum and trip home. Sleeping in late, I met Chris Parker in the lobby for our last Continental Breakfast of the trip. 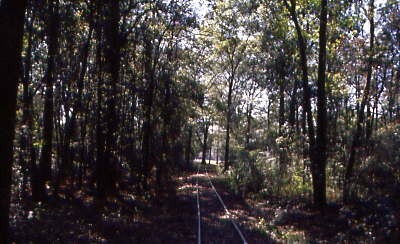 We drove down Dawson Road to where it crossed the Norfolk Southern Albany to Macon Line and followed it east. The line did some street running before turning north just short of the Albany Union Station. 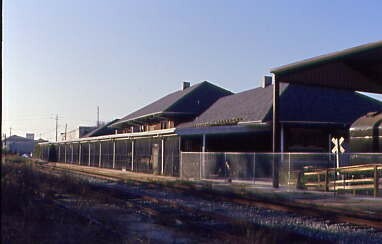 Albany Union Station from track side along the unused tracks. 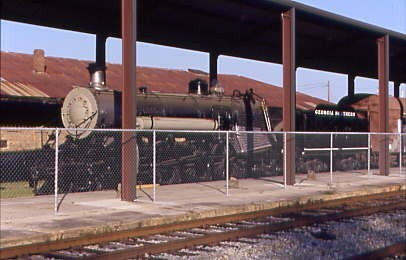 The Thronateeska Museum housed in the station has a railroad collection outside including this Georgia Northern 107, an Alco 4-6-2 built in 1911. 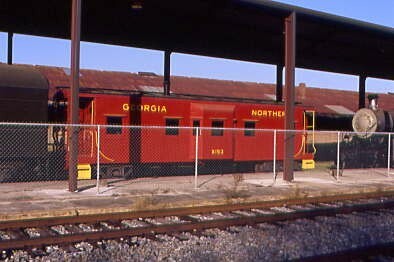 A Georgia Northern Caboose was also on display here. 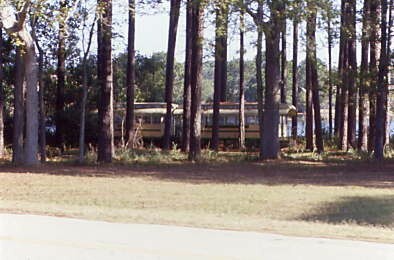 While we were here, a Railnet engine working the Atlantic and Gulf Railroad passed through town in the shadows of the trees. 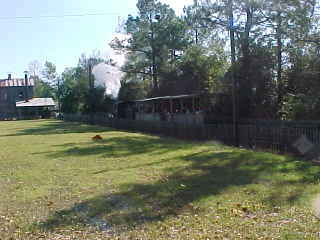 Our attempt to photograph the Norfolk Southern in Albany was in vain but we did photograph the yard office. 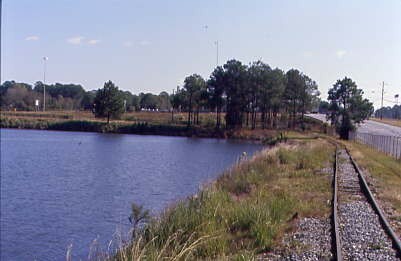 We headed east out of Albany on US 82 towards Tifton. 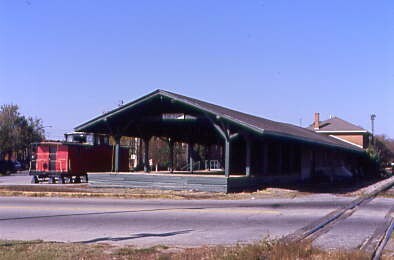 In Tifton, we found the Chamber of Commerce in the old brick Southern Railway Station. Inside I found a very friendly staff who gave me directions to the Georgia Agrirama Living History Museum at 8th Street and Interstate 75. 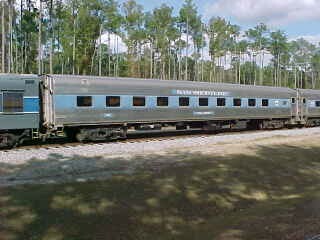 We left the Chamber of Commerce and crossed a railroad track where I looked east and spotted a railroad car. We drove over to that location. 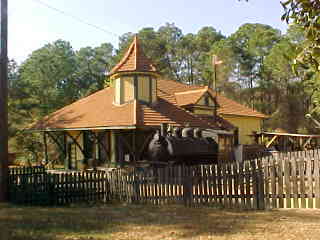 Here we found a Tifton Terminal Railroad trainset. 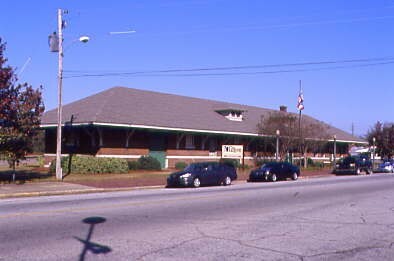 The Tifton Terminal Railroad has its offices in the old Atlantic Coast Line Station. 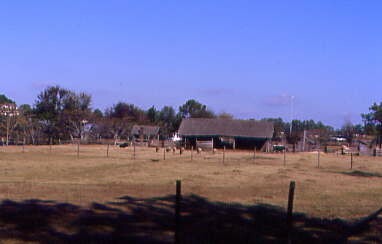 From here we drove to the Georgia Agrirama Living History Museum. 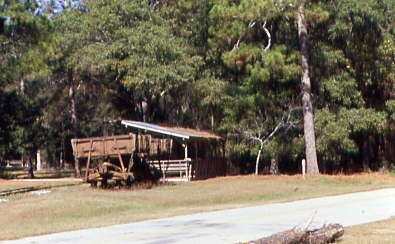 This sign along Interstate 75 tells all travelers about this unique museum. We parked in their parking lot then walked into their main entrance. 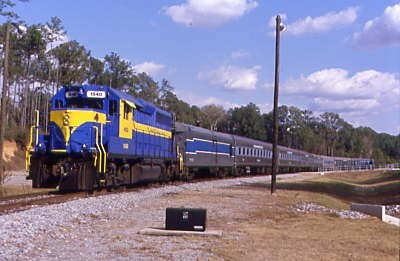 We paid three dollars to ride the train, signed their guest book and I gave out one of my Trainweb business cards that has my web site highlighted in yellow and my e-mail address on it. Chris and I then walked outside and found the train station. 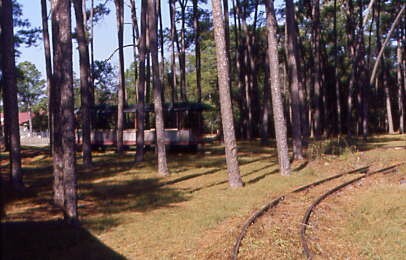 About a minute later we heard a whistle and the anticipation of riding this railroad grew in each of us. A small crowd of children were also waiting and got really excited when they spotted the train coming. How do you think I felt? Engine 1 pulled into the station. We met the train crew and I gave out my business cards. Chris and I boarded the last open car. After a few minutes, we were off for a ride on the 1.3 mile loop around the museum grounds. 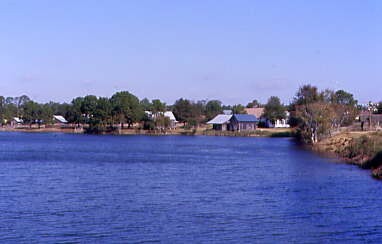 Views of the lake that the train runs along the east and south shores. Two extra coachs on one leg of their wye. 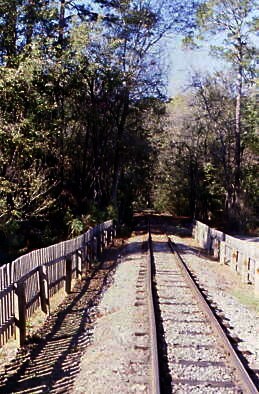 The train is turned every so often to equalize wear on the rails. We passed the shop where engine 3, a Porter built in 1924 and once owned by the New Jersey Raritan Sand Co., is being restored to service over time. Looking back as we finished the end of our trip. 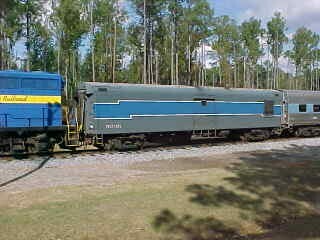 We thanked our crew and I asked if we could get a picture of the train in sunshine? Since there were no other passengers waiting, the crew said yes and we were off for a second roundtrip this time making a few stops. 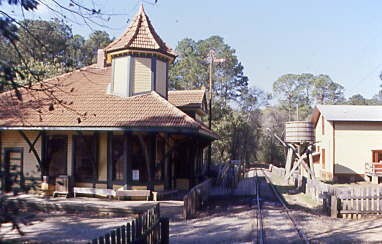 The station came from Montezuma, Georgia built in 1885 and donated to the museum in 1975. This station is unique as it was bought out of a Sears Catalog as a kit. If you could buy a house from Sears why not a depot from Sears too. 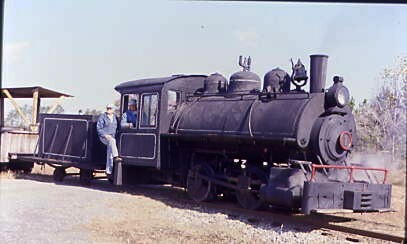 Our train passed a steam tractor on our way to the photo spot the crew and I picked out. Our train posed at the photo spot. 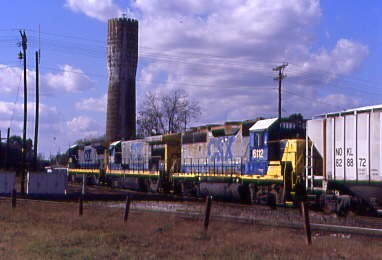 Our train crew of Leyman Jernigan and Arle Purvis took the time to pose for a picture on their engine. 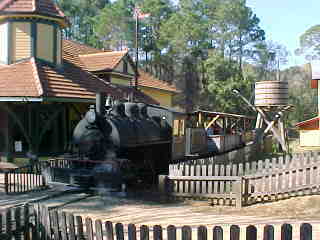 They take turns being the engineer and conductor on each trip around the park. Running along the south shore of the lake. More passenger cars on another leg of the wye. 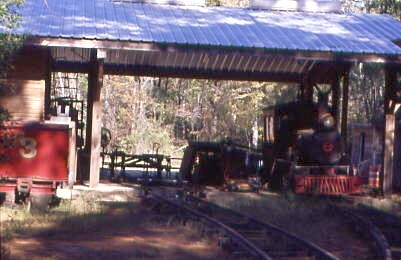 A standard gauge ore car off to the side of our narrow gauge loop. We paused at the shop for a closer look at engine 3. 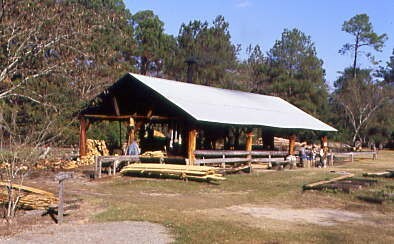 The train passed the restored operating lumber mill. 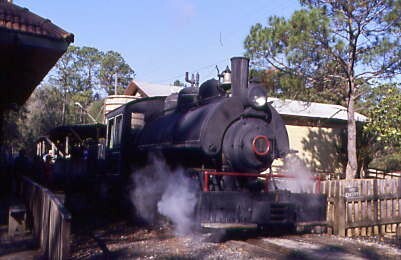 We returned to the station once again thanking the crew for two great rides and a fun filled experience on their railroad. Chris and I walked away two very happy people. 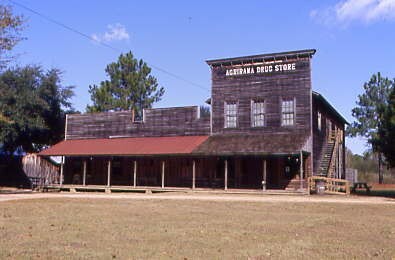 We visited the Agrirama Drug Store for some post cards before I went outside to watch the next departure from the station. That evening I got an e-mail from James A Higgans, Director - Agrirama Georgia's Museum of Agriculture, who passed this information on to me. 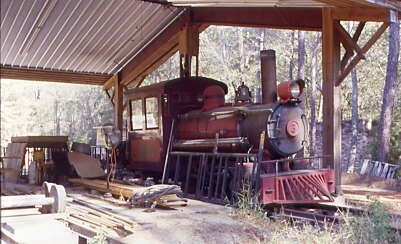 "We have a short distance, but it is a nice trip around the property for an old logging train. For special events such as Halloween, it is packed all night long. 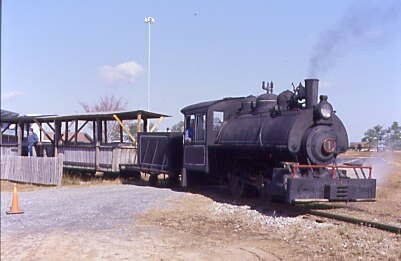 We have another (actually more colorful) locomotive which we hope to have restored in the coming year. Our Foundation is trying to find a group or certain individuals that would be interested in helping the restoration effort. It will probably cost in the range of $100,000." If any of you would like to help just contact the museum by their e-mail. 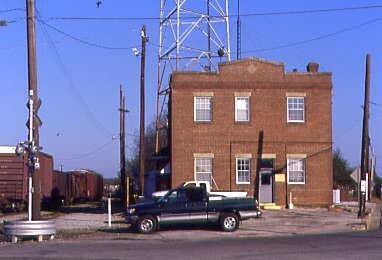 After such a great railroad experience and the true surprise of the trip, I drove back on 8th Street to gas up paying $1.97 the lowest price I paid in a few years. 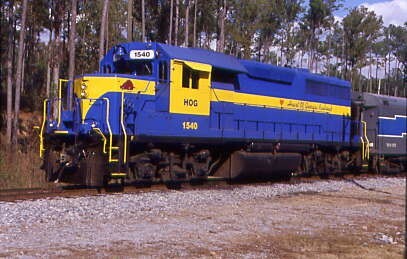 We drove north along the Norfolk Southern Macon to Valdosta main line on US 41. 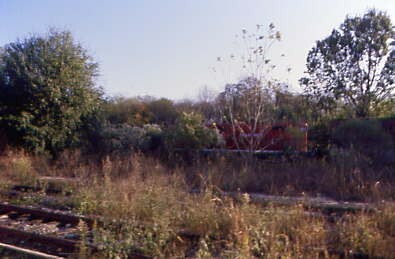 A track gang at Chule working on the main line meant no trains any time soon. We got to the triple railroad crossing in Cordelle just after a southbound NS local went by. 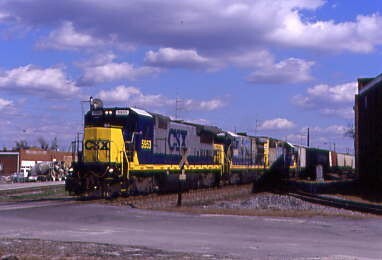 A waiting two unit CSX power set went through the crossings to the CSX small yard here. 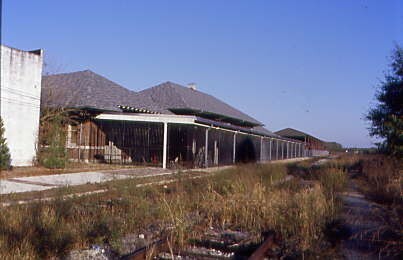 We stopped in at the Sam Shortline Railroad Offices for some brochures and post cards. The very friendly staff then gave us directions to find their train. We returned to the Cordelle Crossing to wait for any train action. 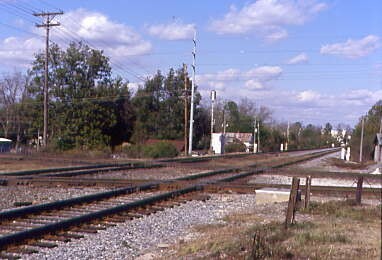 A view of the triple railroad crossings of the CSX, Northfolk Southern and Heart of Georgia Railroad. It was a cold and windy day while we waited for a train. 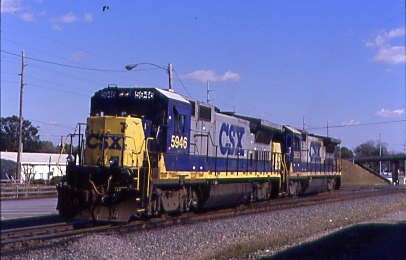 A CSX northbound freight passed through Cordelle. 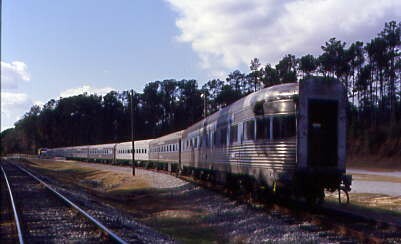 We next drove west on US 280 to the Georgia Veterans Memorial Park where we found the Sam Shortline passenger train laying over until its next trip. 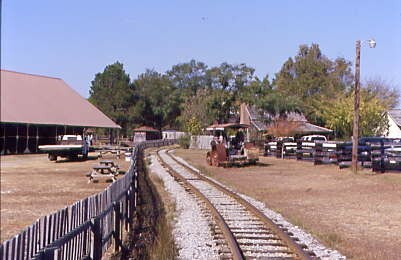 View of the front of the Sam Shortline passenger train set. 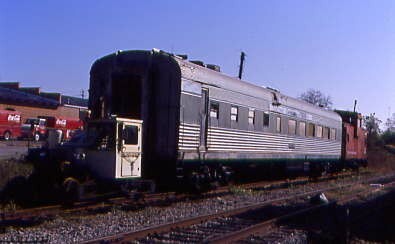 View of the power car. 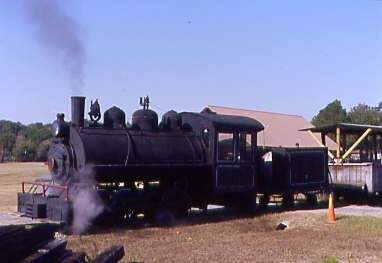 The rear of the train. 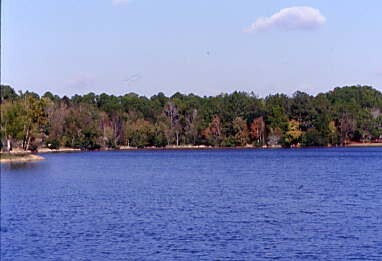 Once done we drove west to Americus then down to Smithville, Dawson and Sasser before we returned to Albany. We looked for the Walmart as Chris wanted to put his digital camera pictures on a disk. Once we got the right directions, I dropped Chris at Walmart and I returned to the Best Western to print my boarding pass, check my e-mail and relax. I picked Chris up at Walmart and we drove to Applebee's for dinner. After dinner, I gassed up the Kia, made a few phone calls, checked my e-mail and printed Chris' boarding passes. Later I walked across the street to the quick mart for a pack of powder donuts and a cinnamon roll for a pre flight meal after the 4:30 AM EST wake up call. I called it a night knowing I had a very predawn wake up to look forward to. Up with the wake up call followed by my morning preparations and a check on e-mail, it was time to check out of the Albany Best Western. I waited for Chris in the lobby then headed for the ice covered Kia. We drove back to the Albany Airport, dropped the rental car and keys off in the Hertz return box before going into the airport to wait for our flight to Atlanta. We waited before passing through security and they began loading our flight at 6:20 AM EST. 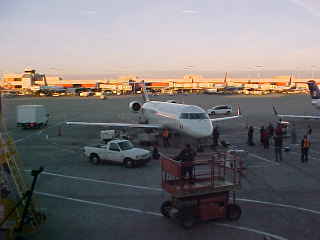 Back aboard another CRJ-200 for the flight to Atlanta in Seat 4D. We took off from Albany at 6:53 AM EST and headed northwest to Columbus before turning towards Atlanta. Change of connecting flight info was given out with my connecting flight and I changed from Gate B26 to B21 with this flight now landing at Gate C30. A good walk would be my order of the morning. We touched down in Atlanta at 7:25 AM EST. I walked into Terminal C for a picture of our plane before getting a USA Today to read during my layover. I met Chris off the plane and we took the escalator down to the lower level. Chris had to get to Terminal A so I said my goodbyes to him before he boarded a train. I walked to Terminal B where I waited for my flight to Orange County at B21. I listened to Yes "Drama" during my layover time in Atlanta. I was the first person on the plane assigned First Class Seat 2D for my flight home to Orange County on this B757. The plane left the gate at 9:17 AM EST and took off at 9:44 AM EST. The inflight movie was "March of the Penguins". After the movie Jeff Beck "Greatest Hits" along with taking a break for a Cheers "Thanksgiving with Carla" episode kept me going west. Cloud cover took over across Arizona below us and on into California. We descended through the clouds near Cabazon and bounced our way to John Wayne Airport. We touched down at 10:55 AM PST and taxied to Gate 12. I said my goodbye to my excellent flight crew before exiting the airport finding my mother at the prearranged location at the bottom of the stairs. My mother drove me home via Main Photo where I dropped off my film. I returned home a tired Chris but one who was very satisfied after a great trip to Georgia. PS The missing boxes at work were never returned.